Hey CMM&S fans! As I've stated before, laundry is one of my least favourite chores. The washing and drying is fine, but when it comes to folding laundry, I am a menace. Really, my folding looks like it was done by a two year old that decided to play with the clothes. It seems like I'm all thumbs, especially when I'm trying to fold a t-shirt that is full of wrinkles and static. I have tried fabric softeners like Snuggle, those dryer sheets that literally make my skin crawl when I touch them because the fabric just feels "wrong", but I have been trying to use more natural products and save energy in our home. I was really excited to be given the opportunity to try out Woolzies Dryer Balls. The company that sells Woolzies is Soft by Nature, Inc, a family owned company in Hudson Valley region of Southern New York State. The product itself is made in Nepal, but you can find out more information about Woolzies on their webpage by clicking on the link above. Woolzies has been doing Blogger reach-outs where they send the Blogger their product to test and review. I received the dryer balls in the mail last week, and I've since used them for all of my laundry. 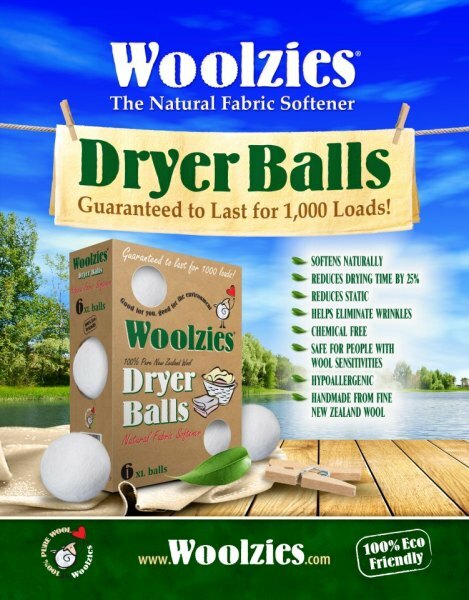 What are Woolzies Dryer Balls? Woolzies are wool balls that are handmade from New Zealand wool. They are free of chemicals and dyes and will not fall apart in your dryer. The dryer balls are about the size of a tennis ball or perhaps bigger. Since they are handmade, the dryer balls may vary in size, colour in texture. You get six of these in the one box and according to the manufacturer, you can use the six dryer balls for either a small, medium or large load. They recommend if you do extra large loads to use eight. Once finished with the laundry, I just toss them back into the dryer and let them stay there, so that makes for easy storage and this way I'll never forget to add them to my load like I used to do with the dryer sheets. They're soft, yet firm and very fuzzy. I'm a tactile person, I feel the need to reach out and touch everything to see what it feels like. As I mentioned with the dryer sheets, I can't stand how those feel so if possible I made my husband put the dryer sheet in. As weird as you may think it is, I absolutely love the feel of these dryer balls on my hands, so that was a big plus in their favour. I'm not sure that I'd like to wear clothes made out of these as it might be itchy, but at least my first reaction wasn't that they felt awful. For those of you that may have an allergy to wool, Woolzies states that these are perfectly safe as they don't normally come into contact with your skin and don't shed. Woolzies bounce around in your dryer, they naturally separate and create space between your laundry, thereby allowing the hot dryer air to circulate better and subsequently cutting down on drying time by about 25% in large loads and as much as 35-40% in small loads. This of course saves both time and money for you and energy for the environment. Do Woolzies reduce drying time? I decided my very first test for Woolzies was to find out if they really did help my laundry dry faster. We have a huge comforter that we use on our bed that is literally a load in itself. Sometimes if it gets wrapped around the centre column just the right way, the whole washing machine goes into spaz mode and tries to dance away from the wall. Our dryer is a little larger inside, so not too many problems there, but it takes forever to dry as the comforter is huge. I usually run the cycle for 60 minutes and then have to run it for another 30 minutes. After 60 minutes it needed a little bit longer, so I put it in for another 15 minutes and it was done. It reduced the drying time of my large comforter by 15 minutes. My smaller loads of clothes were done about 10 minutes faster as well. Do Woolzies reduce static and wrinkles and make your clothes softer? I say yes to all three. When doing my laundry, I did not add in Snuggle, and instead just let the dryer balls do their magic. One of the loads was a fuzzy blanket that always comes out with at least a bit of static, and this time there was none. My clothes were not wrinkled and everything felt soft. I actually paired my Woolzies dryer balls with my Nellie's All-Natural Laundry soda and everything came out clean, soft and static free. Overall, I'm very pleased with the dryer balls. I think they happen to live up to their claims and I especially like how they are natural and handmade. They also didn't make a lot of noise in the dryer either like I originally thought they might. A set of 6 Woolzies sell for $34.95 and shipping to Canada is $6.95 for a total of $41.95. They do ship Worldwide though. If they last for 1,000 loads, the cost of them works out to just over $0.04 per load. I'd consider that a worthy investment considering they really do reduce the drying time of your laundry unlike regular fabric softeners which just work to reduce static and soften clothes. With Woolzies you get more for your money, and while the initial investment may seem a lot, the long-term savings are worth it. You can purchase them directly at the Woolzies website HERE. But, one of my lucky fans will also get their own set of Woolzies! They have kindly sponsored a giveaway here at CMM&S that is open Worldwide! All of my fans at CMM&S are eligible to enter. The contest will be by Rafflecopter entry, and the winner will be randomly chosen at the end of the contest term. Please be sure to read all of the contest terms and conditions below. This product was provided for review by the manufacturer. All opinions on this blog are my own and were in no way influenced by the manufacturer. For more on my disclosure policy, please check out my About Me page. When on the page Woolzies Dryer Balls, post the comment in the Rafflecopter entry. Once it's posted, click "Posts by Others" and then under your comment it will show "1 minute ago" or whatever time, then right click on that post and choose "Copy Link Location". Then post that link in the Rafflecopter. Giveaway ends 4/15/2013. Only the first three entries are mandatory, there will be other optional entries and you can earn more daily if you choose to do the optional entries daily. This giveaway is in no way affiliated with Facebook or Twitter. You are providing your information to CMM&S and not to Facebook or Twitter. The winner's information will be shared with the contest sponsor for the purpose of shipping your prize. This contest is sponsored by Woolzies and the prize will be sent to the winner by them. CMM&S is not responsible for lost or missing prizes. All entries will be verified and CMM&S reserves the right to disqualify any entrants that provide invalid information or do not complete an entry requirement. The winner will be contacted by email from moneymakersandsavers@hotmail.com after the close of the contest and must provide their shipping information within 48 hours or a new winner will be drawn. Entering this contest will be taken as your consent that CMM&S has the right to publish the winner's name on the CMM&S blog, Facebook page and Twitter. Cleaning the oven is really my least favourite household chore! my least favorite job is putting the laundry away! lol love to wash it, dry it and even fold it! I hate mopping the floors and cleaning the toilets! My least favorite household chore is scrubbing the floors. Least favorite would be dishes. We do 3-4 loads a day UGGH! Wow, that's a lot! How many people do you have in your family? 4, a 2 year old boy, 5 year old girl but we do alot of baking and cooking. We don't do as much "From scratch" cooking or baking as we could/should, so I could definitely see where you would need to more dishes that way. Cleaning the bathroom - hate it! Bathrooms and windows are the worst. My least favorite chor is cleaning the whole Bathroom! my least favorite chore is taking the clean dishes out of the dishwasher. i could fill it up all day long but i hate emptying it. Cleaning the shower and dishes! That would be dusting for sure! I really dislike scrubbing floors! Cleaning the shower stall would have to be my least favorite followed by sweeping. My least favorite chore is cleaning the oven!! Washing the shower doors. Yuck! Cleaning the bathroom would be my least favorite. I actually like dusting and cleaning the dishes! Mopping or cleaning the bathroom for sure! My least fav chore would be LAUNDRY! I dislike cleaning the bathroom, even though I LOVE a clean bathroom!